Scroll down to order kits. Please note: Sizes are not relative & contents of case not included. A Honing Kit is the simplest and cheapest way to get a razor sharp polished edge on all your woodworking tools and knives. 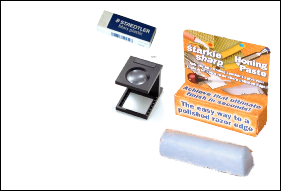 Firstly use the 8x Magnifier to check the state of the edge of whatever you’re sharpening and then you know what needs to be done with your Diamond Whetstone. While you’re using the Diamond Whetstone™ you can check with the 8x Mag how your sharpening is going and whether you need to make any corrections. 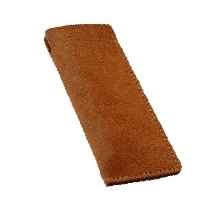 Once you’ve used your finest grit then is the time to rub some Honing Paste into the Leather Sheath and using a fair bit of pressure hone your edge up to a polish. It’s amazingly simple and absolutely no skill is required! Injection Moulded Plastic Case. This sturdy injection moulded high quality hinged plastic case will hold any of the large 8” to 11” Diamond Whetstones™ or DuoSharps® and keep any other of your Diamond Sharpeners tidy. It has two metal hinges with removable stops which hold the lid open at 90 degrees and two front catches and will stand up to quite hard wear and tear. We have used these for several years at our shows and they stand up well to the knocking about they get. 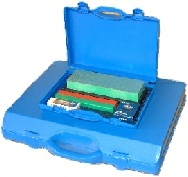 Illustrated is Plastic Case Code: PPC12 Size: 12.5" x 10" x 2.5" (Royal Blue) suitable for 8”, 10” and 11” Diamond Whetstones™. This shape has been changedand the stick is larger. The product will be sent out without the illustrated pack. This shape has been changed to a flat rectangle. Block. To add this to your Diafold® purchase for only £9.95 quote Code: SPHKDIAF at checkout. Save £4.15 (27%). 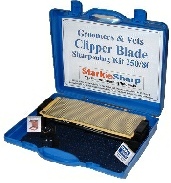 This kit is a “Must Have” for serious fieldsports knife sharpening.